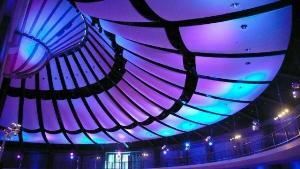 Ambiance Lighting Pros, Inc. is a full service event technology provider, bringing cutting edge creativity to your event along with years of industry experience. We are artists of light who transform simple blank walls into works of art to create the perfect ambiance for every event. Ambiance Lighting Pros, Inc. supplies the latest in audio-visual, staging, and technical support for galas, concerts, trade shows, conventions, corporate events, church productions, meetings, weddings, bar/bat mitzvahs, private parties, receptions, and decor lighting. We offer turn-key event design and production and are located only minutes from Downtown Los Angeles, Hollywood, and Pasadena. Ambiance Lighting Pros, Inc. prides itself on its professionalism, punctuality, strong client relations and individual attention to the details of each event. Due to its willingness to work within our clients' budgets and its generosity in striving to always exceed the client’s expectations, we receive numerous referrals from happy clients. We work one-on-one with our clients from the design phase through production to achieve the exact look and feel to make their event flawless. We aim to leave a lasting impression by creating the perfect ambiance for your event. Ambiance Lighting Pros, Inc. has an exceptional management team to guide its success. Daniel Villa and his team have over 50 years of audio, visual, lighting, and business experience between them. Villa has worked as technical director and project manager to some of the biggest production and rental houses in Los Angeles. Villa has worked hand in hand with numerous celebrities such as Macy Gray, Mayor Villaraigosa, Sheriff Lee Baca, Michael Chiklas, Ice Cube, Snoop Dogg, Chaka Khan, Ariana Huffington, Paris Hilton, and T-Pane, to name but a few.